Kirkland & Ellis, Eversheds Sutherland, Bryan Cave Leighton Paisner (BCLP) and Skadden Arps Slate Meagher & Flom are in contention for major honours at the Transatlantic Legal Awards. The quartet are shortlisted to be named Transatlantic Law Firm of Year at the ceremony, which is jointly hosted by Legal Week and The American Lawyer and takes place in London on 14 June. The nomination for BCLP follows the US-UK merger of Bryan Cave and Berwin Leighton Paisner this April, while this February Eversheds Sutherland announced that it had broken the $1bn revenue mark in its first financial results since its own transatlantic tie-up in February 2017. Kirkland, meanwhile, recently overtook Latham & Watkins to become the world’s largest firm by revenue. Skadden has secured the most nominations for this year’s awards, having been shortlisted in nine categories. Other leading contenders include Sullivan & Cromwell, which is shortlisted in five categories, and Cravath Swaine & Moore, which is shortlisted in three; with partners from both firms being nominated for Dealmaker of the Year – Cravath head of corporate and international Mark Greene and Sullivan Frankfurt-based partner Carsten Berrar, who co-heads the firm’s capital markets group. In all, there are 11 practice awards, including M&A Team of the Year (Large and Midmarket), Private Equity Team of the Year and Finance Team of the Year. Last year, Clyde & Co and Quinn Emanuel Urquhart & Sullivan managing partner John Quinn were among the big winners. 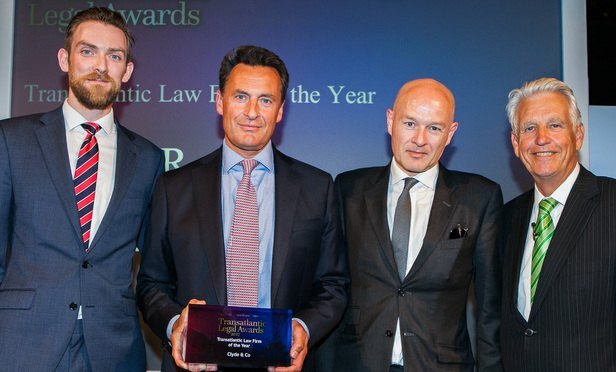 Clydes was named Transatlantic Law Firm of the Year, while Quinn picked up the award for Transatlantic Law Firm Leader of the Year. Skadden took home three awards, winning the Restructuring, Arbitration and Finance Team of the Year categories. The judging panel will be made up of senior ALM journalists, led by Georgina Stanley and Gina Passarella, editors-in-chief of Legal Week and The American Lawyer respectively.